This story was updated at 1:19 p.m. EST. 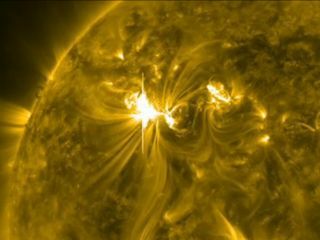 A massive solar flare that erupted from the sun late Tuesday (March 6) is unleashing one of the most powerful solar storms in more than five years, a solar tempest that may potentially interfere with satellites in orbit and power grids when it reaches Earth. "Space weather has gotten very interesting over the last 24 hours," Joseph Kunches, a space weather scientist at the National Oceanic and Atmospheric Administration (NOAA), told reporters today (March 7). "This was quite the Super Tuesday — you bet." Several NASA spacecraft caught videos of the solar flare as it hurled a wave of solar plasma and charged particles, called a coronal mass ejection (CME), into space. The CME is not expected to hit Earth directly, but the cloud of charged particles could deliver a glancing blow to the planet. Early predictions estimate that the CME will reach Earth tomorrow (March 8) at 7 a.m. EST (1200 GMT), with the effects likely lasting for 24 hours, and possibly lingering into Friday, Kunches said. Typically, CMEs contain 10 billion tons of solar plasma and material, and the CME triggered by last night's X5.4-class flare is the one that could disrupt satellite operations, Kunches said. "When the shock arrives, the expectation is for heightened geomagnetic storm activity and the potential for heightened solar radiation," Kunches said. This heightened geomagnetic activity and increase in solar radiation could impact satellites in space and power grids on the ground. Some high-precision GPS users could also be affected, he said. Airplanes that fly over the polar caps could also experience communications issues during this time, and some commercial airliners have already taken precautionary actions, Kunches said. Powerful solar storms can also be hazardous to astronauts in space, and NOAA is working close with NASA's Johnson Space Center to determine if the six residents of the International Space Station need to take shelter in more protected areas of the orbiting laboratory, he added. The flurry of recent space weather events could also supercharge aurora displays (also known as the northern and southern lights) for skywatchers at high latitudes. "Auroras are probably the treat that we get when the sun erupts," Kunches said. Yesterday's solar flares erupted from the giant active sunspot AR1429, which spewed an earlier X1.1-class flare on Sunday (March 4). The CME from that outburst mostly missed Earth, passing by last night at around 11 p.m. EST (0400 GMT March 7), according to the Space Weather Prediction Center, which is jointly managed by NOAA and the National Weather Service. This means that the planet is already experiencing heightened geomagnetic and radiation effects in advance of the next oncoming CME. "We've got a whole series of things going off, and they take different times to arrive, so they're all piling on top of each other," Harlan Spence, an astrophysicist at the University of New Hampshire, told SPACE.com. "It complicates the forecasting and predicting because there are always inherent uncertainties with any single event. Now, with multiple events piling on top of one another, that uncertainty grows." Scientists are closely monitoring the situation, particularly because the AR1429 sunspot region remains potent. "We think there will be more coming," Kunches said. "The potential for more activity still looms." As the sun rotates, the AR1429 region is shifting closer to the central meridian of the solar disk. From there, flares and associated CMEs may pack more a punch because they are more directly pointed at Earth. "The sun is waking up at a time in the month when Earth is coming into harm's way," Spence said. "Think of these CMEs somewhat like a bullet that is shot from the sun in more or less a straight line. When the sunspot is right in the middle of the sun, something launched from there is more or less directed right at Earth. It's kind of like how getting sideswiped by a car is different than a head-on collision. Even still, being sideswiped by a big CME can be quite dramatic." Spence estimates that sunspot region AR1429 will rotate past the central meridian in about a week. The sun's activity ebbs and flows on an 11-year cycle. The sun is in the midst of Solar Cycle 24, and activity is expected to ramp up toward the solar maximum in 2013.